Following on from my blog post on the best error 404 pages, I’ve put together 3 answers to common questions about error 404 pages and their impact on SEO performance. These questions often surface in our SEO training courses, so here’s my attempt to clarify. 1. 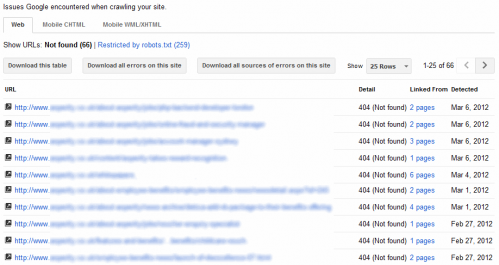 If I have error 404’s, will this impact on my search rank? The short answer is, no. Pages on the web are sometimes ephemeral. They come and go as content changes. Google accepts this as part of the normal evolution of content. In fact Google themselves claim that they prefer you to return a proper 404 response code rather than a “soft 404” explained below. Error 404’s can harm your SEO performance when you have broken links on your own website. If a search bot follows a broken link that should have linked to a key page, there’s a chance this page will be ignored and excluded from the search engine index. And even if that key page did manage to get indexed (e.g. by submitting a sitemap), the broken link may prevent it from inheriting the maximum amount of link equity. From a UX perspective, if your website is strewn with broken links, this is sure to have a negative impact on brand and user experience. The chance of a user continuing their user journey when confronted by missing pages is minimal as their tolerance to adjusting the URL or going back and choosing alternative navigation options will be pretty low. 2. 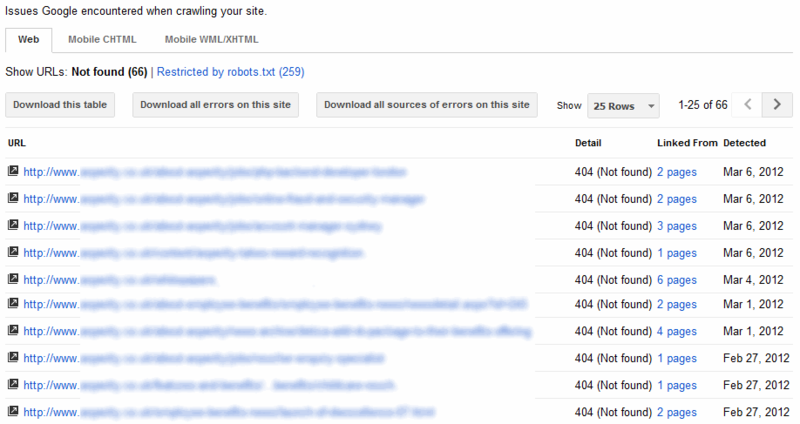 How come Google Webmaster Central reports lots of error 404’s on my website when all my website links work ok? When you log into Google Webmaster Central, click on “Diagnostics > Crawl errors”. The report displays the error 404’s found by Google. Even if your website is squeaky clean with 100% link integrity, you may well find other websites linking to your pages that no longer exist. Equally, these external links may contain typos in the link URL. In both these cases Google will report error 404’s. The above example has important link building implications. If you’ve retired pages that happened to have lots of backlinks, the crawl errors report will act as a prompt for you to set up 301 redirects from incorrect URLs to new ones. That way you will preserve the link equity from those backlinks. You’ll also do your visitors a favour when they click on these external links and get redirected to a useful page rather than an error 404 page. Equally, if you have external backlinks with typos in the URLs, again, set up 301 redirects to the correct spelling of your page URLs to maintain the link equity. As an alternative to Google Webmaster Central, you might want to look at the Link Juice Recovery Tool which effectively does this the above for you. 3. What’s a soft 404 and do I need to worry about it? Ok so this gets slightly more technical. A soft 404 is when your web server returns a response code other than 404 for a web page that doesn’t exist. The most common reason this occurs is if a website owner creates a customised error 404 page with a cool design and returns the page with a 200 response code. Google then interprets this as a “normal” page which is actually incorrect. Remember, you can return a 404 response code for whatever content you want – and your error pages are the obvious pages to return this code. Another really common example of incorrect use is redirecting unknown URLs to the home page rather than a page with a 404 code. Google claims that both of the above can change how the page is interpreted and indexed and thus could have a negative SEO impact. If you want to check what server response code your web page returns, it’s easiest to use the “Fetch as Googlebot” feature in Google Webmaster Central. Thanks for clarifying about 404 pages. This is one question that some people worried about if it has a significant impact in their SEO performance. I am an advanced SEO specialists, and have enjoyed reading your article. Keep up the good work. i have some question to clear but i am short of time will come back to ask. Just a quick question, hopefully someone can answer. I have been told that creating more than 30 redirects per day from /404 pages can have a negative effect on SEO. Is this true? Hi Qasim, I haven’t heard that before but if you can share anything that corroborates it, by all means let us know.